It is hard to give a title to the famous writer and intellectual Taha Hussein, whose death we are commemorating on its 40th anniversary, as he was not a mere university professor, or writer, or novelist, or literary critic. Defining him through one of these alone would both misrepresent and underestimate his talents, as a number of historians and literary critics recognise. A recent event hosted by Egypt’s Supreme Council for Culture (SCC) marking the 40th anniversary of Hussein's passing chose to focus on the pedagogical aspect of his work as an introduction to this multitalented blind man whose works are still able to give lessons to the present. 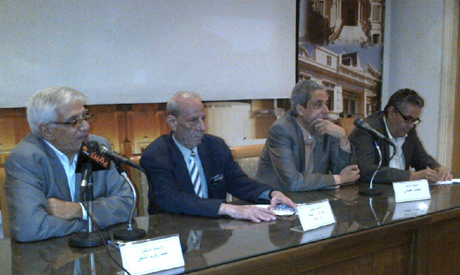 Participants in the event included historian Mohammed Afifi, chair of the Department of History at Cairo University, Kamal Mogheth, an education expert, Ahmed Zakaria El-Shalq, historian, and Abdel-Moneim Tallima, literary critic. They chose to discuss his short yet controversial work, The Future of Culture in Egypt, which was released for the first time in 1938 and was republished by the SCC last month. Taha Hussein (14 November 1889-28 October 1973), the dean of Arabic literature and one of the 20th century's most influential writers in Egypt and the Arab world, is author of dozens of works ranging between criticism, literature and translation, among which the most controversial were On Pre-Islamic Poetry and Al-Ayyam (The Days). Despite having lost his eyesight at age three because of ill-treatment, Hussein obtained his PhD in 1914 on the poetry of Abul-Alaa Al-Maari, becoming professor of Arabic literature and later minister of education. “We commemorate Taha Hussein’s anniversary in the hope of inspiring what can be useful for us. I believe he can tell us a lot of things, especially in his short book, The Future of Culture in Egypt,” said historian Mohammed Afifi. For Afifi, the lesson we get from this book is that culture and education are no less important than political independence, which for him sends a very strong message to us today. Cultural transformation is an urgent matter in a country that witnessed a revolution and a dizzying turns of political events over the past three years. “Taha Hussein's book was written in the aftermath of the 1936 treaty that gave Egypt its independence from Britain, posing the question: What will we do after independence? Hussein says political independence that is not mirrored in cultural and educational reform can be easily lost. There’s no renaissance of a society without reforming culture and education,” Afifi asserted. He added that the book tells us that if we keep on seeing only the political activist and analyst on screens everyday, and kept on neglecting cultural reform, there is no guarantee the great sacrifices Egypt has made will yield results. Taha Hussein was always a man with a message to deliver. He had an intellectual and social commitment towards his people, forging an enlightenment project and was not locked up in an ivory tower, according to historian Ahmed Zakaria El-Shalq. Since 1908, Hussein was involved in writing articles in partisan newspapers, where he tried to convey a message to the public, he added. According to El-Shalq, Hussein was elected the first Egyptian dean of the Faculty of Arts at Cairo University in 1928 — something that outraged European embassies, as the tradition had always been that the dean was European. Hussein refused to concede to pressure and insisted to be a dean, even if only for one day. And that is what happened. He was and he resigned the next day. This event turned Hussein into a public figure in Egyptian society and the academic field as well, and this position was reinforced. When Hussein was elected again as dean of the faculty in 1930 but was impeached by Egypt’s prime minister, he gained the support of the university director, Ahmed Lotfy El-Sayed, who resigned in protest at what happened to Hussein. Students carried Hussein on their shoulders marching in large numbers into the university on 9 March 1933. For El-Shalq, this is the real role of a university professor: breaking academic chains and widening his reach to society. Author and education expert Kamal Mogheth said that with age Taha Hussein becomes more precious. Considering Hussein as the writer with the most comprehensive renaissance project, and one of the rare intellectuals who succeeded in being coherent in thought and deed, Mogheth expressed the wish that his principles would continue to inspire generations today.